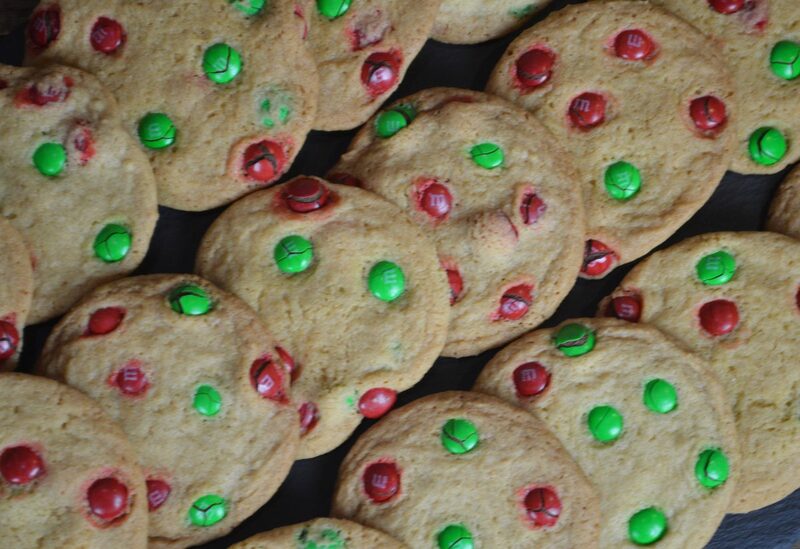 These Christmas M&M cookies are delicious and fun! This recipe is easy to follow and a fun holiday tradition for the whole family. Kids love to help decorate the cookies. These cookies are crip and chocolatey! In a bowl, combine flour, salt, baking soda and baking powder. Whisk the mixture. In two batches add the flour mixture to the sugar mixture and mix until it is a consistent texture. Remove the bowl from the stand and fold in half of the M&Ms with a spatula. Using a two tablespoon scoop, scoop one dozen cookies on each baking pan. Use the remaining M&Ms to decorate the tops of the cookies. Bake the cookies for 12-15 minutes, until golden brown. Remove the cookies from the oven and let them rest on the baking pans until they are set. Remove them and place them on a cooling rack.